I love to talk about wine and about the law – blend the two and I’m happy. I teach an annual employment jurisprudence class at Oregon Health & Science University. I am also a regular lecturer at Willamette University College of Law and the Oregon State Bar on regulatory issues and professional responsibility. Look for an upcoming workshop on employment law and compliance issues at the Chemeketa Wine Studies Program. 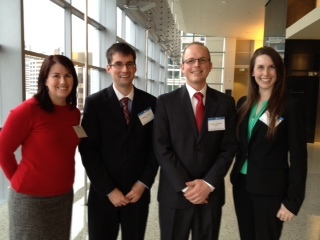 I am also the coach of the Willamette University College of Law traveling appellate team. “Facebook Rules! How to Get Clients and Keep Your License Amid the New Social Media,” Willamette University College of Law Class of 1981 Reunion, live CLE, April 21, 2012. “Ethical Considerations in Foreclosure,” Legal Issues in Real Estate, National Business Institute, live CLE, April 4, 2012. “Legal Ethics and Social Media: What Attorneys Need to Know,” National Business Institute, live teleconference CLE, December 2011. “Social Media for the Ethical Lawyer,” Oregon State Bar Civil Rights Section, live CLE, November 2011. “Money — The Root of All Ethics? Fee Agreements, Fee Shifting and Settlement Considerations,” Oregon State Bar Civil Rights Section, live CLE, October 2010. “Ethical Risk Reduction: 8 Ways to Reduce Your Chances of Being Sued or Disciplined,” Marion County Bar Association, live CLE, December 2010. What is the current status of Oregon’s growler law? Is it ever ok for a prosecutor to be given a bonus for a conviction or plea deal? In light of the financial difficulties facing law firms, is it time to allow these firms to be owned by non-lawyers? Should there be limitations on the type of client solicitations done through social media channels? Is it ethical for a lawyer of an exonerated prisoner to change state laws permitting compensation for wrongful imprisonment and then claim a share of a successful suit? Is it an ethical practice to allow banks, hedge funds, and private investors to “invest” in the outcome of a lawsuit? What are the legal issues facing dentists performing sedation on children?